Looking for a quiet washing machine? Whether you live in a small flat and are tired of encountering sleepless nights (or disgruntled neighbours) thanks to a noisy machine, or are looking for a quieter replacement in an open-plan space, our pick of the best low decibel washing machines were designed with you in mind. Often, when it comes to buying a washing machine, we tend to overlook the importance of quietness, focusing instead on the programmes available, the capacity, the energy rating and so on, which can lead to dissatisfaction further down the line. All these appliances will display their noise level for both washing and spinning in decibels (dB) so the lower it is, the quieter it will be. Other features to look for include anti-vibration, inverter motors and EcoSilence, which all help to reduce noise. What is the best quiet washing machine? When it come to choosing a quiet washing machine, our top recommendation comes in the form of the Indesit Innex BWE 101684X Freestanding Washing Machine, which is perfect if you're looking for something that's affordable and easy to use. 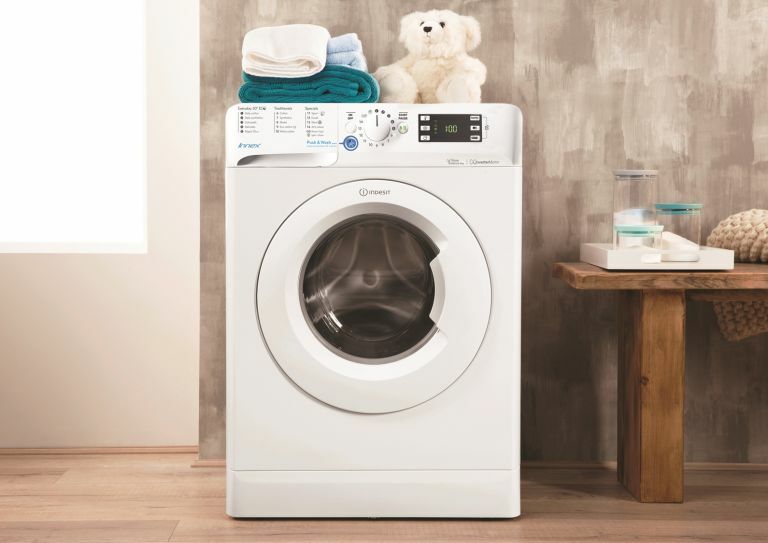 Complete with a clever 'Wash & Push' function, it's easier than ever to get your washing machine started without having to faff around with settings. On top of this, and in a bid to reduce energy and water consumption, this model adapts the amount of water used according to what's required. Quiet washing machines will display their noise level for both washing and spinning in decibels (dB) so the lower it is, the quieter it will be. As a guide, a decibel level in the 40s is low. Other features to look for include anti-vibration, inverter motors and EcoSilence, which all help to reduce noise. While finding a quiet washing machine might be your priority, you'll want to ensure the washing machine you choose fulfils all the other basic functions, too. Think carefully about the type of laundry you do on a regular basis, as some washing machines come complete with programmes designed to tackle pet hair, tough stains on sportswear, work gear and school uniforms. If you're looking for a low energy option, ensure that any models you're considering come complete with a good energy rating and reasonable water consumption levels. This washer has a silent inverter, which makes it ultra quiet, and it also features voice assist, which allows you to choose or set the wash programme, ask for suggestions about the best programme to use as well as ask for stain removal advice. AXI can advise on the best time to do the laundry based on the weather forecast and it also remembers your favourite programmes as well as giving info on energy usage and how to reduce consumption. This really is the washing machine of the future! This one features EcoSilence Drive™ for extremely quiet operation as well as durability. For added stability, there’s also a new design to the side walls, which reduces vibration. Users love the AutoStain option that removes four of the most common stains, as well as a special programme for cleaning and maintaining the drum, something we tend not to think about otherwise. Buyers also rave about the Reload function, which means you can add or remove an item of clothing by simply stopping the running cycle and opening the door before carrying on with the wash.
A great option for open-plan kitchens, as this model has a super-silent spin cycle thanks to its ZEN Technology™, which combines a new induction motor with improved design that minimises vibration. It’s also Quiet Mark approved so you know you’re getting an ultra quiet model at a good price. Design-wise it comes with 6th SENSE® backlit control for ease of use.